End bracket side panels are 8” tall x 12” long, fabricated from 11 gauge steel with a 2” long cutout for end pulley removal. 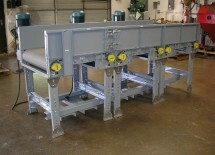 End bracket filler beds are V-Grooved for positive tracking, formed from 11 gauge steel and braced with welded 3/16” x 1 1/4” x 1 1/4” steel angle stiffeners to the underside. 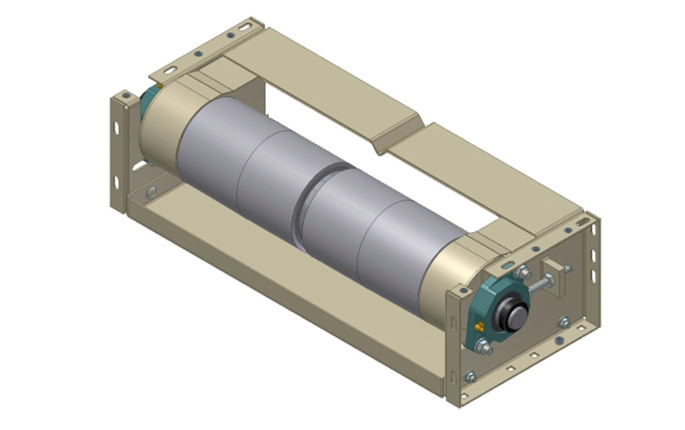 For load/unload queue configurations, 14 gauge steel finger guards are available for shrouding the ends of the pulleys, and are supported by the filler bed stiffeners. Square head set screws and jam nuts are provided for end pulley adjustment and tensioning.